The Bosch Inverter Ducted Split system provides supremely-efficient comfort by adjusting operating speeds rather than a simple on/off control like other units, thereby reducing operating costs and saving you money. These robust and durable units are made with the Bosch quality you expect and deserve. The system’s intelligent features work in tandem with your thermostat to automatically learn your preferences, while integrated sound dampening features keep the units nice and quiet for your peace of mind. The direct-drive fan blades provide vortex suppression to reduce sound of airflow exiting the condensing section, thereby retaining relatively low noise at high speed - with sound levels as low as 56 db. Intelligent control features help adjust the output capacity allowing the unit to keep the temperature and humidity at your desired levels without fluctuation. Whether it be the summer or winter, the system keeps your home comfortable and the living conditions to your desired taste. The air coil provides exceptional heat transfer and low air-resistance for high-efficiency operation that can help lower your energy costs. The high-efficiency variable capacity inverter compressor can adjust output to any level between 25% and 110%, to perfectly cool and heat your home using minimal energy for maximum comfort. The units come standard with an electronic expansion valve (EEV) to ensure proper refrigerant flow during all conditions in order to optimize the unit’s process to the highest efficiency possible. Bosch offers a complete range of air handler units from 2 through 5 ton sizes. These units are robust and constructed with heavy duty commercial grade epoxy powder coated steel for durability. The unit comes standard for up flow applications. These cabinets are field convertible for horizontal right, horizontal left, or down flow/counter flow applications. The blower motor is a constant torque ECM motor and comes standard in all size units. These intuitive motors can deliver comfortable air flow at quiet sound levels, while adapting to changing conditions in your home. 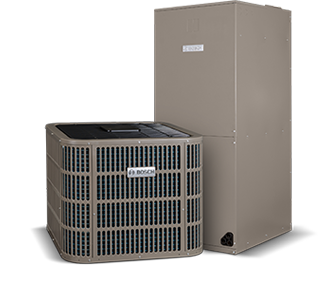 Additionally, the unit is a true modulating unit by varying the compressor speed for smooth temperature transitions and ultimate humidity control within the home. Foil faced insulation helps to prevent fibers entering the air stream and ensure against energy loss through the cabinet as well as keeping the unit quieter. The “A” shaped coil is a specifically designed evaporator coil shape that has a low static pressure drop and high efficiency heat transfer capabilities along with latent heat (humidity) removal. Bosch’s “A” shaped coil includes two drain pans to help reduce the build-up of mold, bacteria and airborne pollutants. The drain pans are made of corrosion-resistant composite material for strength and durability rated to withstand 4000 F. For your protection, both drain pans have also been tested to resist UVC light. Electric heat can be added to the air handler for additional heat on-demand when you need it most. The blower motor is a constant torque ECM motor and comes standard in all size units. These intuitive motors can deliver comfortable air flow at quiet sound levels, while adapting to changing conditions in your home. Additionally, the unit is a true modulating unit by varying the compressor speed for smooth temperature transitions and ultimate humidity control within the home. Intelligent control features help adjust the output capacity allowing the unit to keep the temperature and humidity at your desired levels without fluctuation. Whether it be the summer or winter, the system keeps your home comfortable and the living conditions to your desired taste.